This is a story of an individual using the black Salve to treat his cancer with huge success. The following paragraphs and pictures are a personal account of a six and a half year struggle with a pathogen on the surface of my back. The pictures are graphic but I felt it was necessary for people who may have a similar problem to see them, in order to be encouraged that the growth/pathogen, has been destroyed and eliminated from my body once and for all and with a very simple remedy. About six and a half years ago I was planning a trip to Florida and decided, instead of getting burned down there, I would try a tanning bed to prepare my skin for the powerful rays closer to the equator. If any one tells you that these sun beds are safe they are misleading you! I was in for 10 minutes, that’s all it took to cause the damage. I will say this, I did have a pre-existing condition called tinea-versicolor. The Dermatologic Disease Database defines it as “Tinea versicolor is caused by a yeast type of skin fungus, which is present on normal skin. If the skin is oily enough, warm enough and moist enough, it starts to grow into small “colonies” on the surface of the skin.” Earlier work by the late Dr. Royal Rife showed that cancer is a virus that, when in the right medium/conditions, can mutate into a bacteria or fungus and back to a virus, and that a bacteria and fungus can also mutate into the others and back. So, my belief is that the radiation from the rays of the tanning bed hit the tinea versicolor (fungus) and mutated it into a new pathogen that started destroying my skin and growing into a mass, not just on the surface, but well below also. 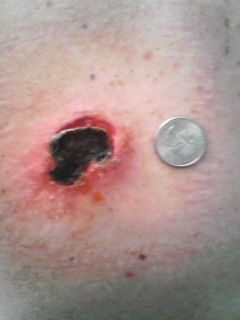 On 4/26/05 I put an herbal preparation of Black Salve on, what was at the time a mass about the size of a half dollar. Over the years it looked like cauliflower on the surface of the skin which would bleed quite a bit so I wore band-aids over it for years. Effective Black Salve is next to impossible to find in the US but you can find it if you look hard enough. I felt tingling and then a burning sensation almost immediately after the application. Some people have felt the need to take aspirin or pain killers to help maintain the pain, I believe it will depend upon each individual case, but better to be prepared by having some on hand if the pain gets to be too much. 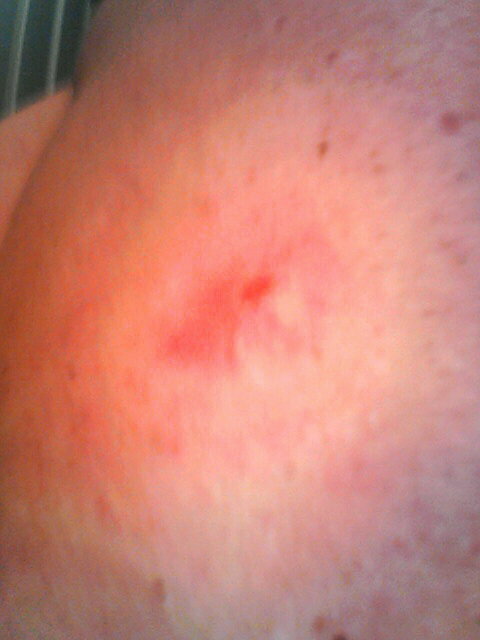 That night the area around the spot swelled all around and out from it until the perimeter of swelling was about the size of a mans fist. 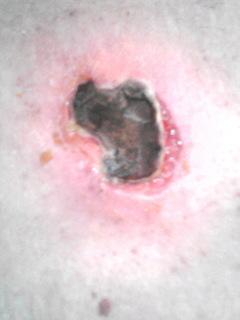 The next morning I woke up and took a shower and the excess Black Salve washed off and left behind an indentation of the skin by about 3 millimeters which was covered by a black scab or eschar. A couple of days before the first application I began taking whole food supplements which helped my immune system greatly! Spanish Black Radish 2 tablets per meal, increasing to 7 tablets per meal after the first application of Black Salve and for the entire month following. The Spanish Black Radish helped dramatically reduce the weeping of pus and debris from the wound, it is an awesome product when taken correctly! Many people have had to change their bandages 4 or more times a day because there is so much leakage of pus, but with the Spanish Black Radish, all the pus was eliminated internally through the lymphatic system and I actually left the same bandage on all day, only changing it the following mornings after getting out of the shower. 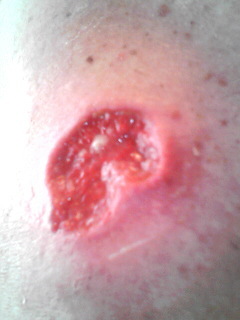 Here you can see what the wound looked like after the eschar fell out on day six from the first application. 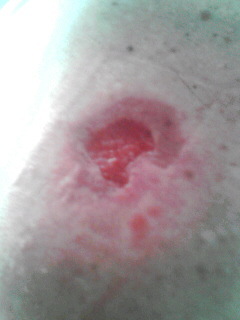 The crater it left behind was pretty deep, but the second the eschar fell out the pain was completely gone! 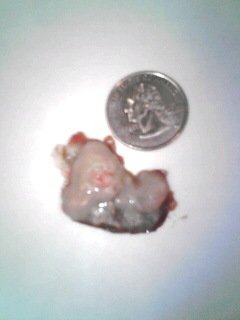 In the next two pictures below you see what the growth looked like from its underside. Pretty nasty! 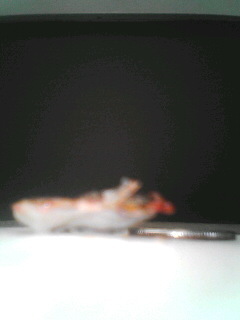 The pic next to it shows how deep it was. That is a quarter laying flat next to it, so as you can see, in certain parts of the growth it was the thickness of 5-6 quarters if they were stacked on top of each other! Now comes the easy part, healing! I used/use two specific formulas to assist my healing over the area with new tissue. The special body wash and also organic coconut oil from www.bionutz.com . 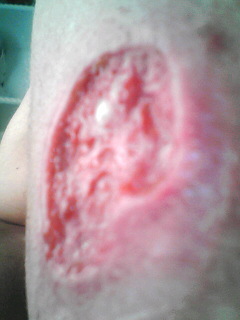 Some areas take as long as a year to completely heal. I do not think mine will take that long because of the aid of these 2 products but I will take them until I am satisfied with the look of the new skin. 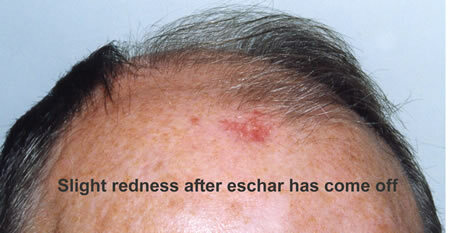 Below are the last two pictures, one at 2 weeks after the eschar fell out and the second at two months after the eschar fell out. As you can see, the wound is completely healed over and some scar tissue remains, which I will continue to take the special body wash and also organic coconut oil until I feel it is totally finished healing. I have successfully used black salve on myself and on my mother-in-law. Myself I have photos taken of the various stages of the healing process. CHICK WEED IN THE TREATMENT OF SKIN DISORDERS Stellaria media, known as chickweed, grows wild throughout Europe and North America. This low-growing plant has pointed oval leaves and small white flowers. Scientific literature primarily focuses on controlling the growth of this plant as a weed, and no evidence indicates the plant is effective for medicinal uses, according to Drugs.com. Consult with a qualified health care provider before beginning any herbal therapy. The primary traditional use of chickweed is as a topical treatment for skin disorders, often in a cream, according to Drugs.com. Some people use it to treat eczema, a common skin condition involving scaling, red thickened patches of skin that can be very itchy. Chickweed preparations can be used to treat the red, itchy rash caused by contact with poison ivy and poison oak, and for healing insect stings and bites. Chickweed may be effective for treating these conditions because it contains relatively large amounts of vitamins, including the antioxidant vitamin C, and flavonoids, as noted by the University of Michigan Health System. It also contains the omega-6 fatty acid gamma-linolenic acid, which may reduce inflammation, according to the University of Maryland Medical Center. For eczema, rashes and inflammatory skin conditions, apply chickweed cream liberally several times a day to affected areas. Chickweed as an internal medicine has a role in folk remedies for a wide variety of conditions, according to the UMHS. Some of these disorders include asthma, bronchitis, blood disorders, conjunctivitis, inflammation, rheumatic conditions, constipation, indigestion and obesity. Due to its mucilage content, the herb is believed to have demulcent properties that soothe mucous membranes. Homeopathic remedies use chickweed for treating psoriasis and rheumatic pain, according to Drugs.com. The young shoots of chickweed are edible and make a tasty addition to salads, providing vitamin C and gamma-linolenic acid for nutrition and health benefits. Gamma-linolenic acid is essential for skin and hair growth, bone health, reproductive system function and metabolism regulation, explains the UMMC. LearningHerbs.com notes fresh chickweed as a component of a cream cheese spread that includes basil and thyme, and as an ingredient in lasagna. The website provides a recipe for chickweed pesto using 2 c. of chopped fresh chickweed along with garlic, pine nuts or sunflower seeds, olive oil and Parmesan mixed well in a blender. You can serve this chickweed pesto over pasta, or use it as a dip. Chickweed brewed into a tea doubles this herb’s medicinal applications. The hot tea works internally to rush nutrition through the body for healing purposes. Since psoriasis tends to flare up in times of stress, a nutritious cup of mild tea also serves to relax the mind so the body can mend. A clean cloth can be soaked in the cooled tea and applied to areas inflamed by psoriasis’s telltale lesions. Be certain to follow up the external tea treatment with a lubricating skin cream. Psoriasis can be relieved from the inside out with the use of an alcohol-based tincture. This remedy is a concentrated form of the herb. It is available in standardized and traditional concentrations. The tincture serves to ease both digestive and skin problems, which surface during an outbreak of psoriasis. This form of medicine may not be an appropriate choice for children or patients who are sensitive to alcohol. Chickweed is often available in healthy garden soil in the early spring. It was introduced to North America as a salad green but fell out of favor in the mid-twentieth century due to its short shelf life in grocery stores. Gardeners know this weed well. It is used as an alfalfa sprout substitute in sandwiches and salads and offers a fresh flavor and nutrition to keep the skin healthy. The inflammation of psoriasis is often brought on by stress. A mildly warm bath can give relief to the mind and body. Tie chickweed into a muslin square and allow it to soak in the bath water. The cloth can also serve as a swab to bring comfort to dry areas. Combine chickweed with rolled oats for extra skin treatment. Internally, chickweed can be taken as a nutritional supplement to take advantage of the high amounts of trace minerals and vitamins contained within the plant’s leaves. A hundred grams of chickweed offer .52 mg of zinc and 7,229 IU of vitamin A, which both top the chart of nutrients recommended for treating psoriasis symptoms. Chickweed is a popular ingredient in herbal moisturizers designed to ease skin irritation associated with psoriasis. Topical treatment for this disease includes creams, salves and ointments. Most herbal creams also include calendula and aloe to revitalize dry, red skin patches. Ointments that include vitamin D along with chickweed are even more effective. A new technique that allows blood to be made directly from skin cells has been discovered. The pioneering approach by Canadian researchers uses human skin stem cells to create blood stem cells without an intermediate step that previously was thought necessary. Until now to make blood stem cells, the building blocks for a variety human cells (called pluripotent stem cells) have been used as a steppingstone a process. This has proven largely inefficient, but research led by Mick Bhatia, scientific director ofMcMaster’s Stem Cell and Cancer Research Instituteat the Michael G DeGroote School of Medicine, has shown that making blood from skin can be achieved in a one step process. The discovery was replicated several times over two years using human skin from both the young and the elderly to prove it works for any age of person. The approach could be used for creating blood for surgery or treating conditions like anemia from a patch of the patient’s skin. Other potential applications include generating bone marrow and improved treatment of leukaemia and other types of cancer, including solid tumors. The research was published in Nature on November 7. Drown the lice by covering your skin in olive oil for several hours. For head lice problems rinse your hair with vinegar. Vinegar helps in killing all the lice nits in a matter of days. Coconut oil for massaging hair scalp after helps. For head lice use Listerine (original flavor): Another remedy for treating head lice is rubbing listerine mouth wash on your head. This will kill all the lice. Massage your head with mayonnaise and comb it after 2 hours. This will kill all the lice and their eggs. Apply a mixture of lemon and butter on your head, wait for 15 seconds and then rinse your head. An anti-lice oil can be mixed with coconut (or mustard) oil and 0.2 per cent lindane (BHC) or 0.1 per cent pyrethrum essence. This oil can be rubbed well into the scalp to kill lice. (Ingredients can be purchased from a chemical dealer). Mix talcum powder with 0.2 per cent prethrum dust in it (or add 10 per cent DDT). Sprinkle this powder on the hair before going to bed and rub it vigorously so that it reaches the roots. Cover your mouth, nose and eyes to protect them from the powder. Anti-louse lotion, either gammabenzene hexachloride lotion or cream (Lorexane, Gammaexane) or Malathion (Prioderma) will kill the eggs which can be removed by a comb with very fine teeth. One treatment is enough but all the family who are infested should be treated and the hair examined regularly for a while. You may consult a doctor for the treatment. To remove head lice and their nits. put any common lotion on your skin generously and then comb your hair out with a regular comb to get any knots out then comb out with a fine tooth comb. Sprinkle salt on your finger and get a tomato. ! No more splinter — and no more torture with needles or tweezers! Experiment & see it work. September 1, 2008 — Veterinarians added a bioadhesive to an existing antimicrobial agent in order to make it an effective protective agent for aquatic animals such as whales. The adhesive was originally developed to treat burns on humans, but the adhesive helps it stay in place underwater, providing protection from infection and allowing animals’ natural defenses work to heal wounds. Anytime you cut yourself or get a burn, one of the biggest roadblocks to healing is infection. That’s especially true for burn patients and those with extremely sensitive skin. Now, there may be a new weapon in the war against infections — even against dangerous germs like MRSA, Super-Staph and other drug-resistant bacteria; and humans aren’t the only ones who stand to benefit Beluga whales, native to the arctic, are some of the Georgia Aquarium’s most popular and talkative residents. John Widgery is a firefighter of more than 20 years. In an unusual trial, man and beluga became the first test patients for a new kind of anti-microbial compound that enhances the effectiveness of antibiotics to fight dangerous infections. 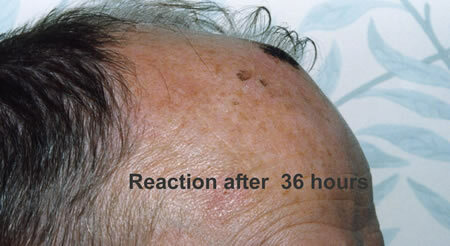 After 12 days of treatment with the experimental anti-microbial, the results were astounding. Widgery’s skin is now back to normal. Meanwhile, University of Georgia veterinarians found they could adapt the same experimental compound to protect beluga whales from dangerous infections by adding a bioadhesive that makes the compound stay on underwater. “The bioadhesive will stick to those lesions, keep them protected from their aquatic environment and let their bodies do the natural defense that they need to do while protecting it from the environment,” Dr. Ritchie says. It’s disease-fighting research for animals — and people. Widgery is grateful he was part of it. “I am not a person that cares what I look like, but I am so thankful that I don’t have those scars,” Widgery says. The whales aren’t complaining either. The human anti-microbial Silvion has now received FDA marketing approval and is available to treat everything from skin cuts to burn injuries. The animal version, Tricide, is being used to treat animals at zoos and aquariums to prevent infection and promote healing. A DISABLED Austrian man was eaten to death by maggots in his bed while his partner slept beside him. The 61-year-old retiree died in an ambulance on his way to hospital in Vienna on Tuesday with the maggots having partly devoured his back. Paramedics notified police after discovering the shocking state of hygiene in the man’s home, and his 34-year-old partner was questioned over his condition. “The man had not wanted to be washed for a long time,” a police spokesman said. According to police, the couple had been together for around a decade, and the victim’s partner had slept in the same bed right up until his death. The dead man had been paralysed for several years following a stroke. MIAMI (UPI) — Wading in the ocean to let salt water heal cuts and scrapes is not always a good idea, health experts say, as bacteria can proliferate in summer months. A little known, deadly bacteria called Vibrio vulnificus can infect open wounds of beach goers and cause a life-threatening illness in those with weakened immune systems, The Miami Herald reported Friday. he bacteria, which occur naturally in warm coastal waters, infected 138 people in Florida between 2005 and 2009 and 31 of them died, the Florida Department of Health said. “The high mortality rate makes it a big deal,” Juan A. Suarez, an epidemiologist for FDH, said. The bacteria proliferate in waters where temperature and salinity are increasing, particularly between the months of April and November, Suarez said. But he advised all people to heal their cuts and scrapes through other means, not ocean water. “It’s probably not a good idea, even if you’re healthy, to go into the water with an open wound,” Suarez said.